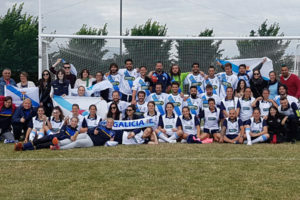 The Galicia GAA men and ladies teams are in Dublin this week to take part in the Etihad Airways GAA World Games. Our colleague Valeria met them a the airport in Santiago de Compostela on Saturday, as they were getting ready for their trip to Dublin. Once in Dublin, the team was back at work, training hard ahead of the championships. On Sunday, it was time for the official presentation of all the Etihad Airways GAA World Games international teams at Croke Park ahead of the Kilkenny vs Waterford hurling semi-final. 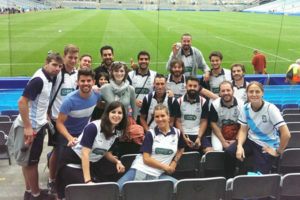 Juanma and Caroline from CaminoWays.com were delighted to be joining the Galicia team members and enjoy the match with them. We’ll keep you posted on their progress! Last year the men came second at the GAA World Games and they are hoping to reach the final again this year; the ladies also did amazingly well and reached third place. Best of luck to the teams! Huge congratulations to both the men and ladies teams as they have both won trophies at the GAA World Games 2016, after an intense week of matches at UCD Dublin. The ladies are the winners of the Shield after beating France in the Shield final (ending up in fifth place overall in this year’s tournament) and the men are winners of the Plate trophy, coming third overall. Fantastic achievements for both teams and at CaminoWays.com we are very proud of their great sportsmanship, as well as their contagious enthusiasm. Well done, Galicia! 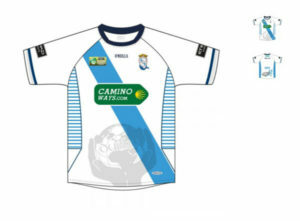 If you would like to get a lovely Galicia GAA jersey with the CaminoWays.com logo you can find it online from O’Neill’s official GAA shop: Galicia GAA jersey.